← Develop a Scope for my Project! 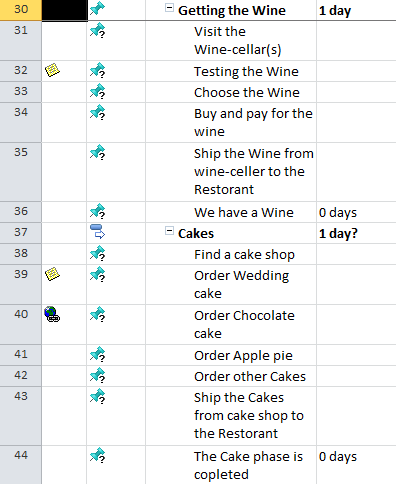 Should I choose Manually or Auto scheduled Tasks? The scope is done! What should I do next? The “Wedding” Project! 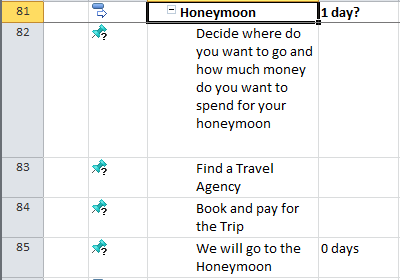 I have made the Scope for my “Wedding” Project in MS PROJECT 2010. 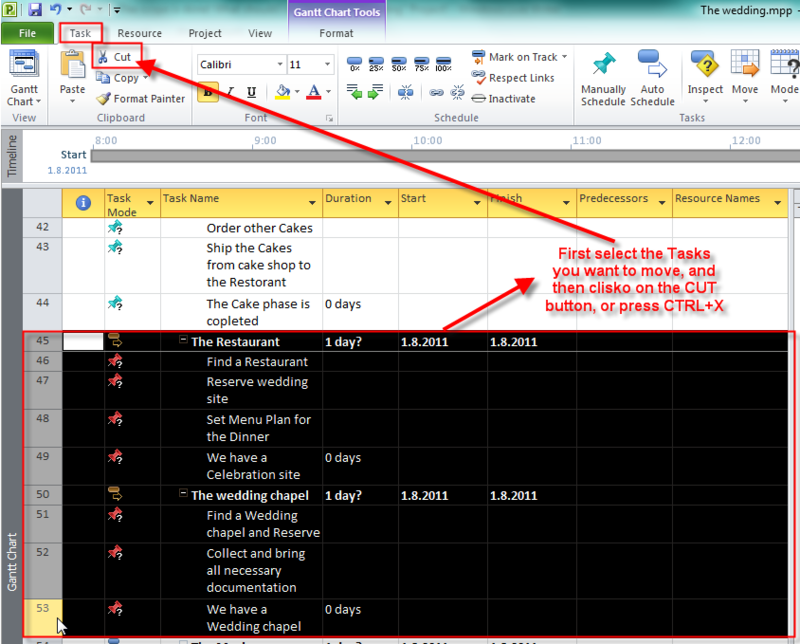 I have task groups (called “summary task”), and each group have a milestone at the end. Those groups are not order logically, and it means that I put them as they cross my mind. In this group I will make a list of my preferred guests. After that I will call them by the phone. Why? Because, I want to know how many of them will accept the invitation, and I have to tell them when the wedding will be. 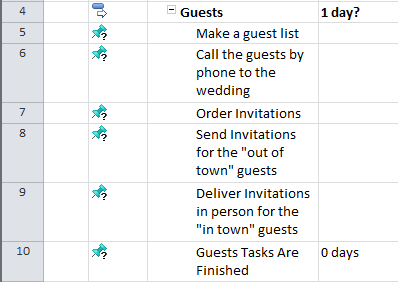 I can skip this “Call the guest by phone to the wedding” Task, and I can make assumption that all my preferred guest will accept the invitation. But, this is, from my point of view, the HUGE RISK? Why? Well, suppose that I have 150 people in my Guest list. If I assume that all of them will come to my wedding, I will reserve the Restaurant for 150 people. Now suppose that I have 50 people from “out of town”. I will have to reserve the hotel for them. And now, suppose that only 35 people come to my wedding? What a disaster will it be, can you imagine? To avoid that risk I will first call them, and I will know how many people will I actually have on my wedding. Then if someone quit just before wedding (because of some disease or something else) I will have less problem, because there is a small probability that many of them will be sick at that moment. 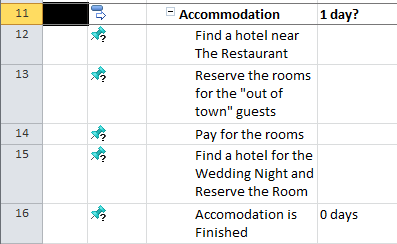 In this group I have tasks for the accommodation for my “out of town” guest, and for the Wedding night. 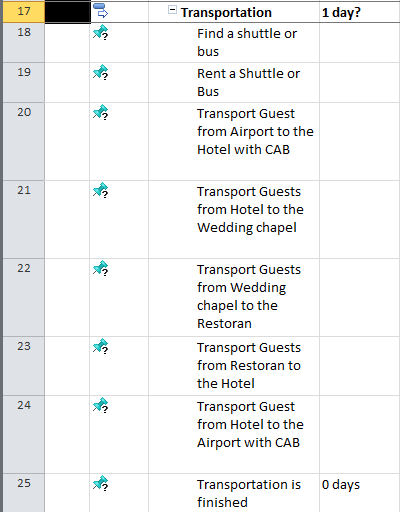 In this group I have tasks for the transportation for my “out of town” guest. Now, we need to find the Restaurant for our wedding reception. In Zagreb,Croatia, you must reserve the Restaurant almost one year before the wedding day, believe it or not! I think there is no need for any further explanation about this groups. You will see in some next post how will we set duration for this group. It has to be hour by hour planned. From now on, you have two possibilities. 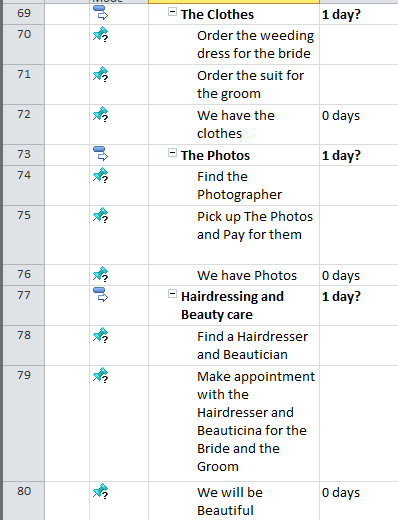 You can download mpp file and follow me with that file, or you can try to add the tasks manually. Be careful. When you move tasks like it was just described, those moved tasks has a new ID number. 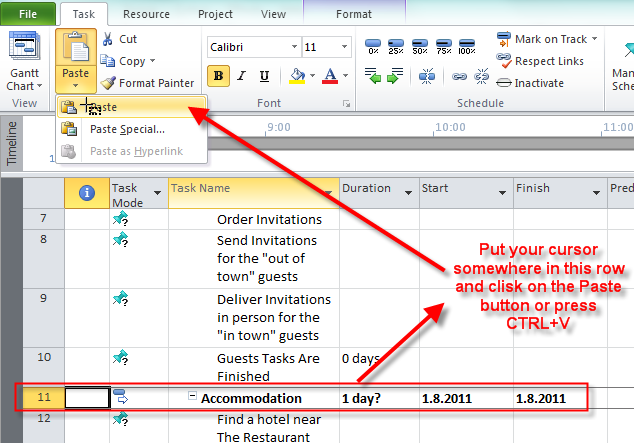 And if you integrate MS PROJECT with some other application and if you are using that ID, you can get in the trouble! 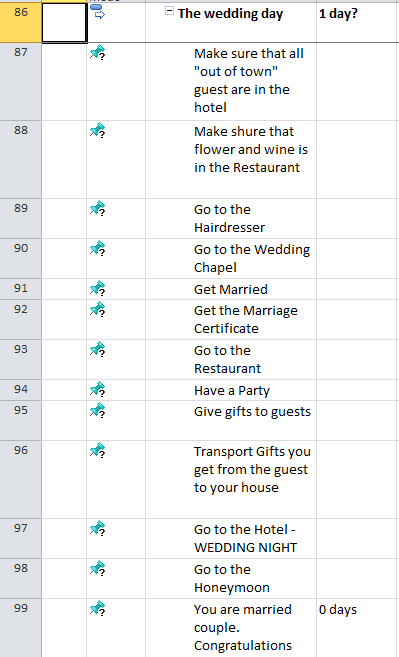 I have finished my scope for the “Wedding” project. What is next? Resources or Scheduling? I will first develop a schedule. I will put duration on my tasks. 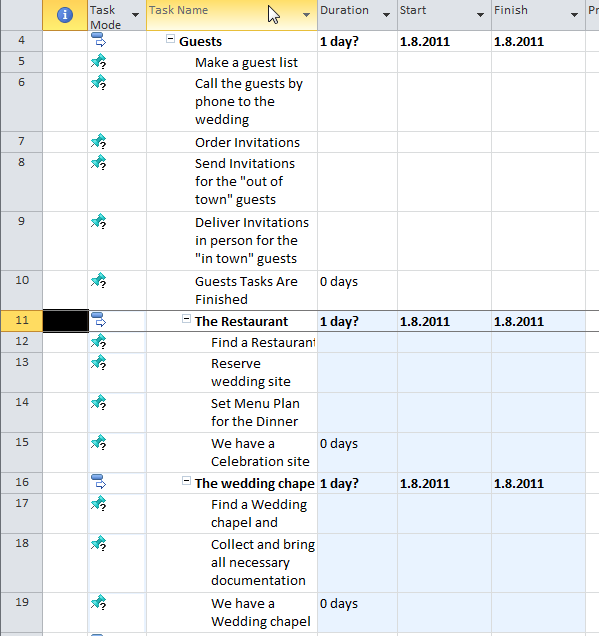 But before that I will set up my Project Calendars. 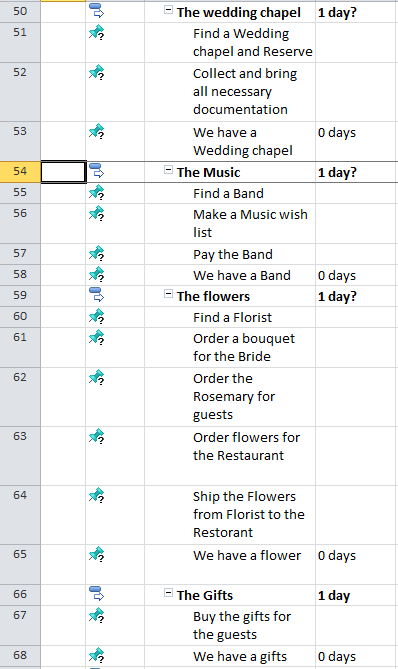 How to estimate duration, how to manage it, and how to set up calendars with MS PROJECT 2010 is the subject of my next post. This entry was posted in MICROSOFT PROJECT, Microsoft PRoject 2010, MS PROJECT 2010, PMI, PRoject Management and tagged MS PROJECT, MS PROJECT 2010, Project Management, Project Management - SCOPE. Bookmark the permalink. 1 Response to The scope is done! What should I do next? The “Wedding” Project!